Cheers! used Michigan ingredients for this New York City inspired cocktail. Listen to Tammy and Lester compare the original NYC version to the Michigan version of the Jesper Lind. The Jesper Lind was inspired by a famous James Bond cocktail, a vesper. This is a stirred drink, not shaken. “I was really excited to come across this cocktail called the Jesper Lind in the Death and Company cocktail book because it really gave me an opportunity to highlight three really nice Michigan ingredients in a cocktail,” said Tammy Coxen of Tammy’s Tastings. 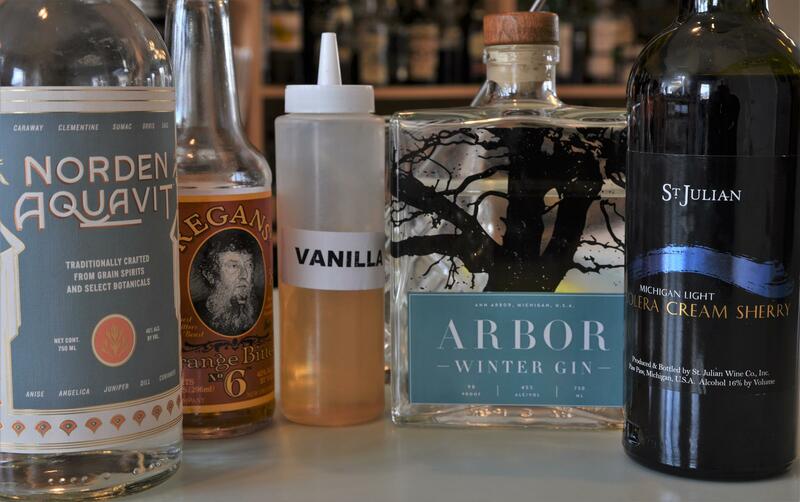 Those three ingredients are the St. Julian Michigan Light Solera Cream Sherry, the Ann Arbor Distilling Company’s Arbor Winter Gin, and Norden Aquavit. Of course, none of those Michigan ingredients was used in the New York City based Death and Company recipe. That’s why there were two glasses of Jesper Lind to taste for this Cheers! experiment. One was the Michigan version and one was the original recipe. “This comes up a lot when you're looking at cocktail books where you may not have the very specific ingredients that they call for. And you always question, 'Can I just substitute ingredients that I have on hand?' So, I thought it would be fun to do a comparison of making this cocktail with the ingredients that they actually called for,” Tammy said. Tammy was especially excited to use the St. Julian sherry. It’s been around since 1973, but it’s not always available at a local wine store. Tammy stopped by a St. Julian outlet on a recent trip to Chicago and bought a bottle. “What's interesting to me about this product is that it isn't made with the same grapes as a traditional sherry. It isn't, for the most part, made with the same technique as a traditional sherry. And yet, the finished product is very, very close to a particular style of Spanish sherry and works brilliantly as a substitute for that style of sherry in cocktails,” Tammy explained. Three Michigan ingredients are substituted in this version of the Jesper Lind. A sip of the Michigan version of the Jesper Lind revealed a surprisingly complex drink that to me was really, really nice. “So, this style of sherry, a cream sherry, is a sweeter style of sherry. There's definitely some pronounced sweetness to the drink. But, it's offset by the dryness of the gin and the aquavit and then amped up a little bit again with the vanilla syrup. But I think it really does play nicely,” Tammy said. The Death and Company original recipe was also quite nice, but the sherry was more pronounced and the aquavit was not nearly as noticeable. I preferred the Michigan version. “We've taken this drink in a different direction you can definitely see there's some similarities between the two. But I agree with you. I think our drink has a lot of interesting stuff going on,” Tammy said. Make simple syrup by combining water and sugar in a saucepan and heating until sugar is dissolved. Let cool. (Alternately, use 6 oz of already-prepared simple syrup if you have it on hand.) Add vanilla, stir to mix, and store refrigerated. 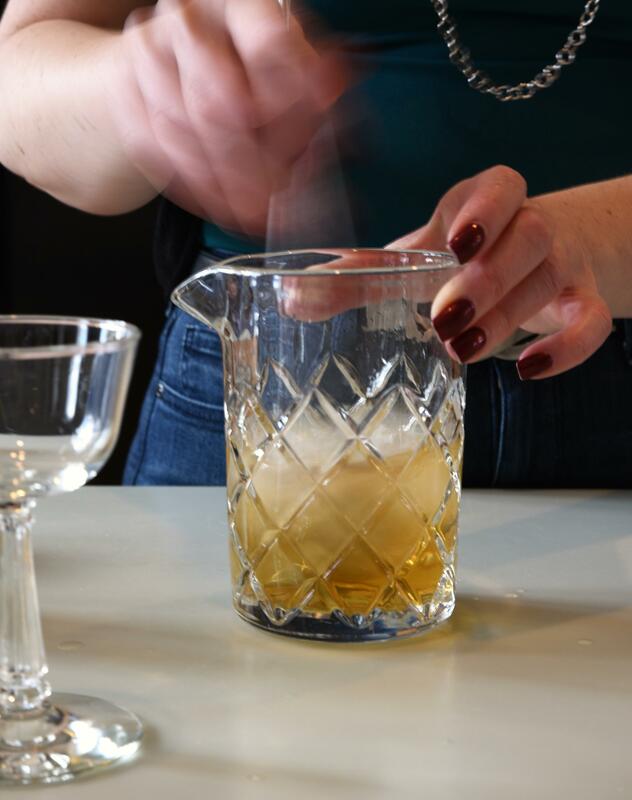 Listen to Tammy and Lester as she mixes the St. Patrick Peppercorn. Mardi Gras in New Orleans is the inspiration for our drink on Cheers! If you’ve ever been on Bourbon Street late at night, you’ll see people sipping from a rum-heavy, red, sugary drink in a plastic cup called the Hurricane. It’s like someone spiked a kid’s slushy.